(Host) Ski resorts across Vermont are winding down for the season – several weeks earlier than usual. Okemo will close on Sunday, while resorts like Bromley, Pico, and Mad River Glen have already shut down. It’s been frustrating for skiers, but as VPR’s Nina Keck reports, it’s been even harder for businesses that depend on them. (Keck) If you drive up Route 4 towards Killington and Pico you’ll pass a lot of hotels that cater to skiers – like the Mendon Mountainview Lodge. Owner Stacey Metivier greets me in shorts and flip flops and invites me out on the deck. (Metivier) "Now for us out here taking a view in of Pico to actually see it without snow, and no snow on our land except for at the tree edge where the sun doesn’t get it – it’s surprising. This is last week of April weather out here – right now – that we’ve seen some 80 degrees pop up on us. (Keck) While Metivier loves the warm weather, she admits it’s played havoc with her and her husband’s forty-room hotel. (Metivier) "We’re impacted in that the phone hasn’t rung this week at all and if it’s ringing it’s inquiries wondering what is going on and it’s definitely dropped fast. 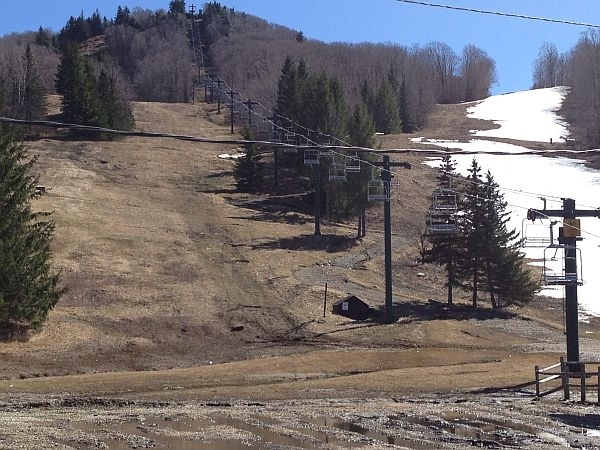 (Keck) In the last ten years, Killington has only closed for the season twice in April – most years they made it to May. In 2002, they closed June 1st. While Killington has not announced when it will close this season, Metivier expects it to be soon. Which means she expects to lose about three solid weeks of spring business she and her husband count on. It wouldn’t be so bad, she says, if they’d had a strong fall foliage season. But Irene botched that up. (Metivier) "We lost probably 50 percent of our groups – because people didn’t know if they would be able to get here. We were full for both Labor Day weekend and the Killington Motorcycle weekend festival, so losing those two weekends right off the start really hurt." (Keck) In Ludlow, Jim Kubec says business at his eight-room bed and breakfast is down 30 to 50 percent this year. As someone who caters to skiers at Okemo, he says he’s used to the ups and downs of the weather. But he says his business hasn’t completely recovered from the recession and having Okemo close early this year, just adds another hurdle. (Kubec) "When the ski resort closes you don’t get the searches on the Internet – you don’t get the notice, you’ve made the shift. Without skiing at Okemo and without foliage there certainly isn’t any peak season." (Keck – Kubec) "Anybody staying there this weekend? I’ve got a couple people, but they’re not coming to ski – they’re actually coming to hike." (Keck) Back in Mendon, Stacey Metivier points to her flip flops and sunburned arms. If this is March, she says shaking her head – you have to wonder what next season will bring. This week, Vermont officials announced plans to continue a partnership with a Canadian airline that brings skiers from Toronto to Burlington. The state is putting tourism dollars behind the effort in hopes of expanding it in the future. A Toronto-based airline is expanding service to Vermont during the ski season this winter.